We’re heading off on the roadtrip of all roadtrips – to save the life of the largest living thing on Earth (and one of the oldest). We’re getting a busload together of the most creative people we know — philosophers, designers, ecologists, writers and others – and traveling to south-central Utah Sept. 21-24. There, we’ll be visiting the Pando aspen grove, our namesake, which ranges over 100 acres from lakeshore to mountaintop. As anyone familiar with Pando Populus knows, the grove is extraordinary for being interconnected at the roots. The thousands of aspen trunks that grow at the site spring from the same root. It’s surely the reason it has existed for hundreds if not thousands of years. And yet, Pando is dying. Deer and cattle are eating it up (the wolves that would have eaten up at least some of those deer have been wiped out). And then there is our changing climate. So we’re getting on a bus and heading to Pando to see what we can do. Because of the people who are coming along, we think we’re likely to come up with some ingenious ideas. We’ll also do some “real” work where it’s needed of the citizen-scientist and conservation variety. And we’ll be engaging with people who aren’t typically thought of as part of the environmentalist choir, like hunters and ranchers. We also plan to have a lot of fun. We’re spending three nights in cabins adjacent to the Pando grove, and bringing along our own chef (in part because we’ll be in a remote location, and in part because we want great food!). During the days, we’re hiking in area of the grove and learning about the ecology of the place from Paul Rogers, the chief scientist for the Pando grove. Then we’re brainstorming innovative ways of saving it. John Bielenberg, who’s legendary in helping groups figure out how to meet the biggest challenges and change the game, is facilitating the entire weekend as a “Think Wrong” Blitz (read more in FAQs below). John Cobb, our own founding chairperson, will be with us to help frame the philosophical perspective. We expect soon to announce other special guests. Interested in learning more? See below for BLOG POSTS from those who are signing up for the trip, the SCHEDULE for the entire weekend, and key FAQs. Ready to just get on the bus? Go here to get your ticket. Or mail a check to Pando Populus directly to avoid the ticketing fee. SCHEDULE: We conveniently leave from and return to Las Vegas, NV. On the way, we drive through the extraordinary Zion National Park. Talks: Orientation and big-picture framing. Explore on foot: Pando Grove. Science: Latest research. Assist data collection. Talks: local issues in conservation. Talks: Urban-rural collaboration. 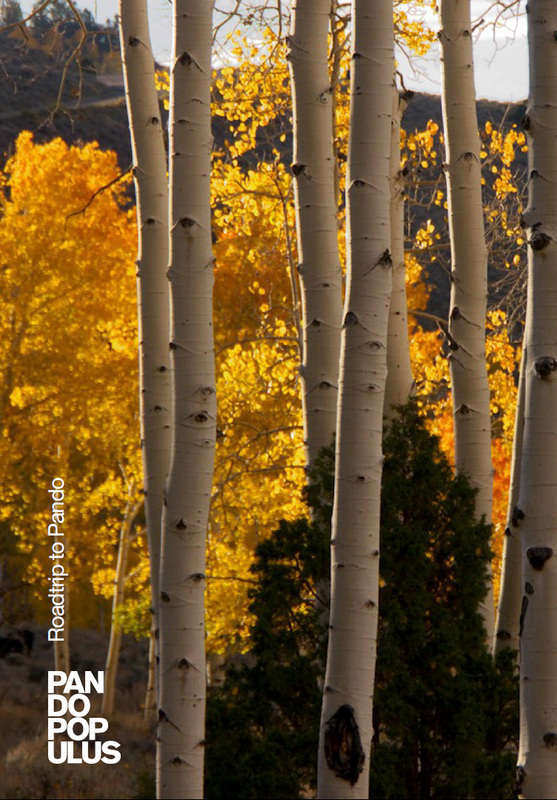 Land-use, ranching, and Pando. Travel by bus: Fish Lake, UT to Las Vegas, NV. Return to airport late afternoon for early evening departures. How do I find out more about the Pando grove? You can start by watching this short video. And check out the information about Pando on our webpage. Total cost to get in on the ground floor of a game-changing event to save the largest organism on Earth is $1,500, all-inclusive. What’s included in the cost of the ticket? Once you get on the bus, it’s all-in: travel, food, accommodations, expert talks and facilitation. We pick you up in Las Vegas and take you back in time to catch a flight home. Do I get myself to Vegas and cover my own costs in town? Yes. You’re expected to cover your own costs of travel to and from Las Vegas, as well as your own room and board while you’re in Vegas. Note that we are recommending a Vegas hotel, which will be the single point of departure on Thursday morning, but an overnight stay is not mandatory. It will, however, ensure a convenient and on-time departure the next morning. What is a Think Wrong Blitz? A Blitz is a fast-paced, immersive, hands-on workshop experience that is designed to come up with unique and fun solutions to big challenges. It’s about thinking wrong because thinking right has gotten us into the shape we’re in. Where do we stay while visiting Pando? You’ll be in cabin accommodations overlooking Fish Lake. Of course, Pando is in a remote area. But the cabins are lovely, many with their own fireplaces, all with their own kitchens, and king or queen beds. What about food? Should we expect to bring our own? You don’t need to bring a thing. We’re bringing in a private chef, and her assistant. There are no restaurants in the area, and only one small general store, and so we’re planning to be self-sufficient. But the chef is superb, and used to working under these conditions — and delivering amazing meals. Because all cabins have kitchens, breakfasts will be handled on an individual basis. Lunches will be boxed/picnic style. Dinners will be special group events. During the trip, everyone will be asked to help out with meal prep at one time or another — but it’s guaranteed to be a fun, interactive experience. What if I want to go but can’t afford the ticket? Let us help you brainstorm ideas to find sponsors. We can share tips and provide you with materials you can use to explain the trip to your supporters. And we’ll make sure your underwriters get “special thanks” in the event credits. This sounds great, but what happens after the Roadtrip is over? Roadtrip to Pando is an inaugural event, which we expect to be followed in 2018 by subsequent roadtrips offering a diverse range of opportunities. The September 2017 event, however, gets you in on the ground floor and gives you the opportunity to help define what downstream events may be. Who is behind the roadtrip? We are! Pando Populus, and we’re doing it for our namesake! We’re working in collaboration with the Western Aspen Alliance and Amigos de los Rios. We expect other collaborating institutions soon to join. Order ROADTRIP TO PANDO 2017, a 40-page book that beautifully documents the inaugural event with photos, reports, and commentary. ROADTRIP TO PANDO 2017 – a journey to save the largest living thing on Earth.